There are inevitable challenges that come up – both on the buy and sell side – that tend to test our abilities to face the unexpected head-on. Folks that can adapt more easily will realize the most success in our highly competitive marketplace. Resistance doesn't create our best and highest selves. I’m part of the “sandwich generation,” which means that just as our boys began to move out and move on, my husband’s mom started experiencing the ill-effects of aging, and moved in… Oh vey! It makes the most sense that she should live with us, but between you and me, it hasn’t necessarily been easy — neither one of us likes taking orders from the other. At 56, I’m now a primary caregiver to a 90-year-old mother-in-law and nagging her to please, for the love of God, use her walker after her recent fall, broken hip, and rehab stint at Piedmont Gardens. My folks, on the other hand, are still living independently in Sonoma, where they luckily have each other for support and 63 years of marriage on which to depend. For better or for worse? You better believe it! Above is Harry, my father, in his latest mode of transportation after several scary spills of his own. 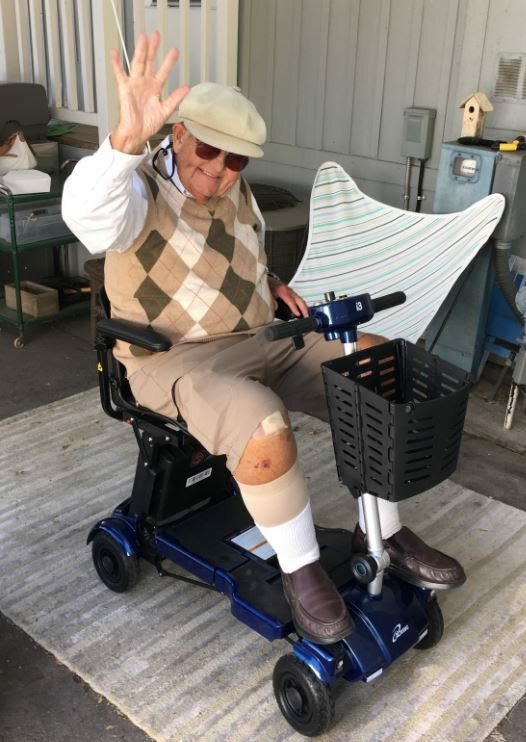 He’s now dividing his time between a walker and this nifty blue scooter to get around town for errands. “Your mother won’t let me drive anymore,” he says. Nor should she. Dad may be loathe to admit it, but we are all far safer with mom behind the wheel. In fact, it’s several months overdue. Nice. His tuition should just about be paid for. What strikes me most about this incredibly humbling phase of life as I compare our two sets of octogenarian parents, is the difference in how they are both approaching their respective challenges. Zee, my mother, (as is her nature) is fighting tooth and nail to maintain the facade of independence and self-reliance, while Harry is more easily surrendering to the new realities of puttering around town on slow-moving wheels — two views. One’s not necessarily more right than the other, but acceptance certainly paves the way for a much easier journey along the bumpy road of life! Or so it seems to me. Lest you think my story just applies to the elderly, it doesn’t. My two sons are as different as night and day, with one decidedly drawn to what’s comfortable and familiar, while the other is actively seeking out the new and unknown. With respect to Real Estate, there are inevitable challenges that come up — both on the buy and sell side — that tend to test our abilities to face the unexpected head-on. Some of us will run for cover and retreat altogether when faced with big pest reports, alarming foundation issues, or tough financing hurdles; some will quite literally freeze and remain in limbo for years unable to progress; some will blindly forge ahead and hope for the best; while others will take each challenge as they come with open eyes, and do what’s necessary to move forward. Not surprisingly, the folks that can adapt more easily will realize the most success in our highly competitive marketplace. I’m currently working with a bright, young couple that happily represents the ideal clients. They’ll be signing closing documents soon on a transaction that’s had more than its fair share of bumps in the road, but they’ve still managed to navigate their way towards a very successful and happy ending. They didn’t run, they didn’t hide and they didn’t become unreasonably rigid or defensive (nor did the corresponding agents) — nor did they pull out in fear, as is often the reaction when the “uncomfortable” exerts itself into the deal. They calmly listened to their options, put great faith and trust in my counsel, contributed excellent suggestions throughout, worked collaboratively to find solutions, and made informed decisions that best fits their goals and needs. In short, these buyers didn’t resist the process, they owned it and were rewarded with an equitable and fair result in the end. That’s the way you get it done: one hurdle, one challenge and one day at a time — and with good intentions, flexibility, great team work, and, at the risk of sounding like I grew up in California (guilty): an open heart. If, like my dear old dad, we hold the expectation that everything is going to work out for the best; that this is just one more roadblock to address; that we will meet such challenges head on; then I believe there’s no limit to what we can actually accomplish. Meanwhile, I’m going to continue to work on that “open heart” thing when it comes to my own life challenges. The other options just don’t seem like winning strategies, nor do they produce many smiles. Certainly, resistance doesn’t create our best and highest selves. Julie Gardner is a Bay Area wife, mother, Realtor, community volunteer, philanthropist, comic-at-heart, weekend athlete, flea market junkie, serial renovator and prolific chocolate chip cookie baker.